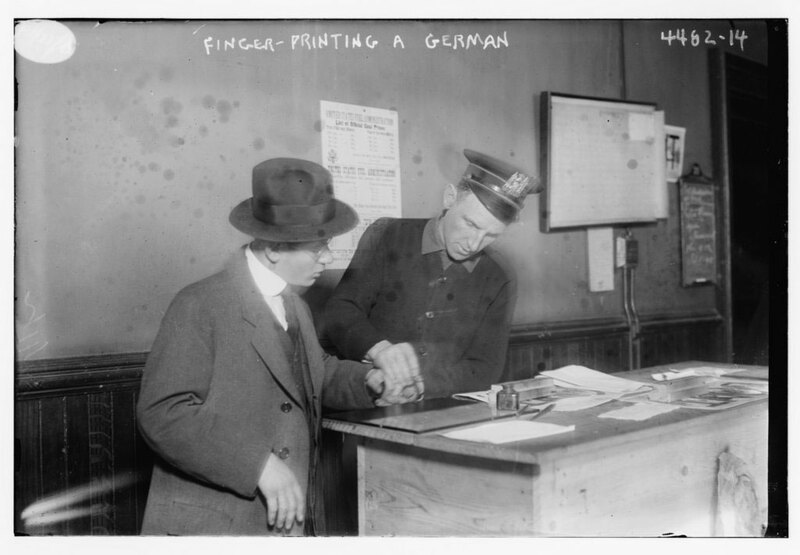 New York City Police Finger-Printing a German, 1917. Library of Congress, Bain Collection, LC‑B2‑4482‑14a. It is difficult to separate Americans' legitimate concerns about German espionage and sabotage from fears flamed by wartime propaganda. 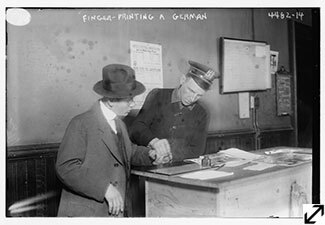 The German agents at work inside the boundaries of the United States had been largely removed by 1917. Contrary to initial pleas in Greenwich newspapers to treat Germans and Austrians with respect, these residents became targets of ethnic profiling and discrimination as the War progressed. 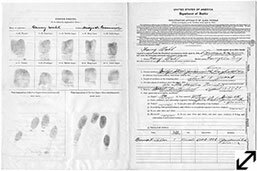 With Proclamation 1364 (April 6, 1917), President Wilson defined enemy aliens as non-naturalized male Germans over the age of 14 and stated that they would be obliged to register. 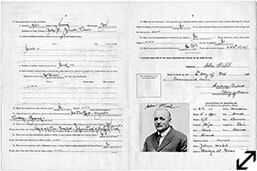 On February 4, 1918, Greenwich Police Chief Andrew Talbot began the registration of German men living in town who were not naturalized citizens. 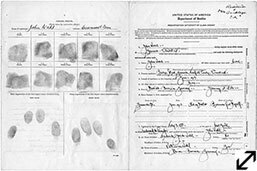 On April 19, 1918, Wilson broadened "enemy aliens" to include non-naturalized adult citizens of Austria-Hungary, non-naturalized German women and wives of non-naturalized Germans no matter what their nationality. 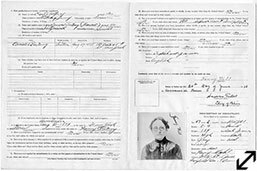 Eventually in Greenwich, schools were banned from teaching the German language, librarians were asked to track who was reading which books in German and representatives of the Department of Justice called on certain German-Americans to warn them about making anti-patriotic remarks. 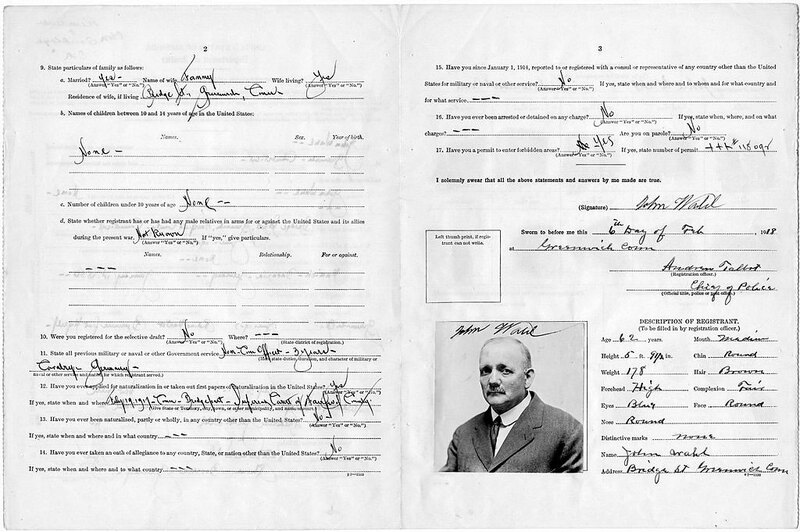 In one instance the Greenwich police arrested Heinrich Plum, an Austrian, for refusing to buy a Liberty Bond "on the ground that he was an alien and a former German army man." 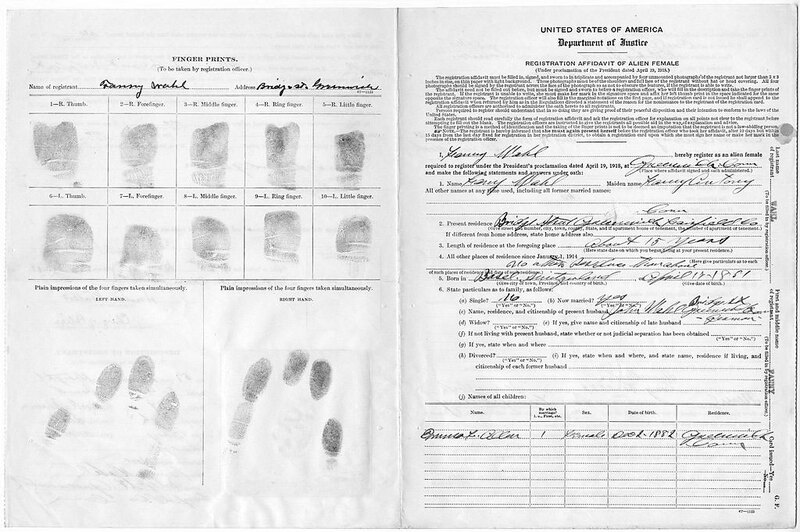 Alien Registration Forms, 1918. Greenwich Historical Society, William E. Finch, Jr. Archives, Donated by the Greenwich Police Department. A portion of the "Enemy Alien" registration forms compiled by the Greenwich Police are now in the collection of the Greenwich Historical Society. 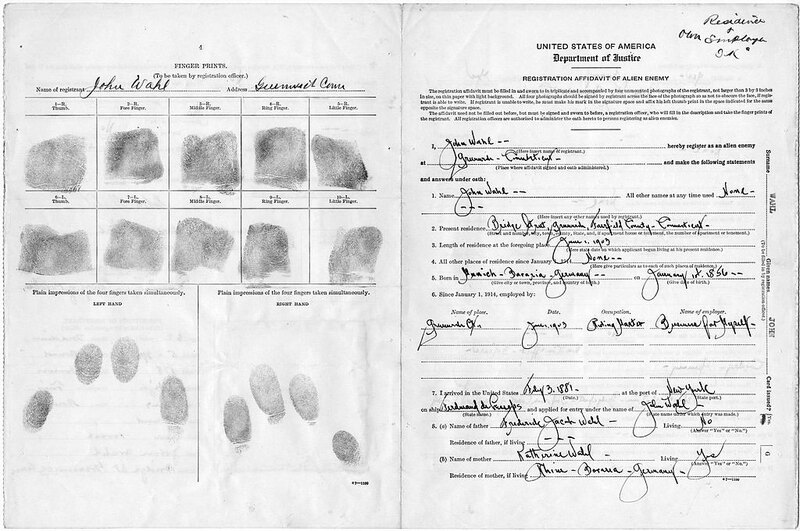 The records provide information about the lives and circumstances of those so defined under federal law.